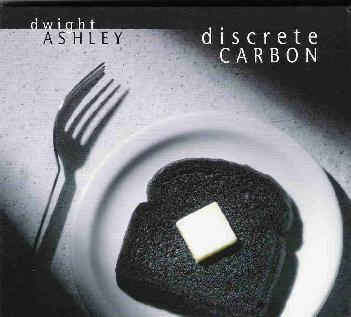 Dwight Ashley - "Discrete Carbon"
A disciple of the Fripp/Eno academy of ambient sound architecture, Dwight Ashley’s debut CD comprises ten compositions recorded between 1999 and 2003. But Ashley’s vision of sound construction is a bit less clinical than that of the masters. The cool, abstract, sometimes impressionistic, landscapes Ashley designs often recall the Cubist sound techniques of such ambient industrial pioneers as Dome, K. Leimer and Michael Brook. Influences aside, Discrete Carbon is an exceptionally well-conceived project, often evoking the quiet grandeur of lost horizons (“It Happened in November”), the stark radiance of self-illumination (“I Thought It Was Here”) and the mysterious wonder of the terrestrial world (“Three Insects” and “Examined by Tweezers”). Ashley’s haunting melodies (chiefly performed on synthesizer, piano and guitar) alternately ring and chime to forgotten cords of desire and longing, and unlike most music that attempts to map similar terrain, Ashley’s miniature sonic dramas rarely decompose into staticity or monotony. Additionally, Ashley is wonderfully adept at balancing a variety of tonal moods, moving effortlessly from Satie-esque irresolution to Frippian catharsis. For instance, “Denial” and “A Colossus Succumbs” are examples of Ashley’s exploration of the darker side of his art. Both reverberate with the ambiance of massive caverns, drifting like glacial epochs through the abyss of geological time, slowly metamorphosing into continents rising out of some antediluvian sea. To be sure, Discrete Carbon doesn’t break any new ground (though who says it has to?) However, there is much here both to enjoy and admire. And considering the regrettable musical ennui that Eno himself seems to be experiencing at present, Ashley proves himself to be a capable practitioner of environmental sound sculpture on Discrete Carbon. It’ll be interesting to see where he goes from here. For more information you can visit the Dwight Ashley web site at: http://www.dwightashley.com.